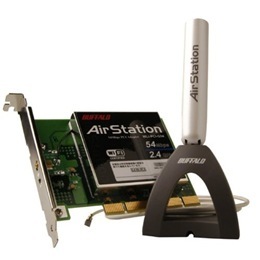 The AirStation 54Mbps Wireless Desktop PCI Adapter-g offers fast 54Mbps wireless connectivity with desktop PCs with an available PCI slot. The 54Mbps Desktop PCI Adapter is interoperable with existing Wi-Fi 802-11b products. The 54Mbps Desktop PCI Adapter includes an Indoor Omni Antenna with 4 foot 9 inch cable that can be positioned away from your computer and out from under your desk to provide better wireless reception, range and signal strength.